What is it and what it can do? 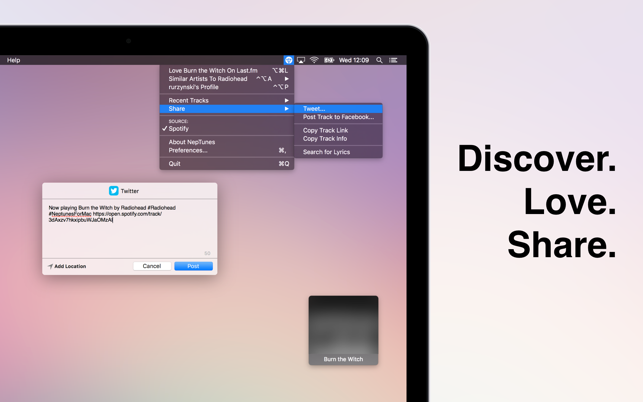 • It's the best Last.fm scrobbler for Mac. Modern, stable, reliable. No duplicates, no missing tracks. Solid scrobbling experience. Fully supported iTunes (with Apple Music) and Spotify. Runs great on OS X Yosemite, OS X El Capitan and macOS Sierra. • Controller for iTunes and Spotify. Change volume. Love track. Pause/Play. Find lyrics. Share to Twitter and Facebook. 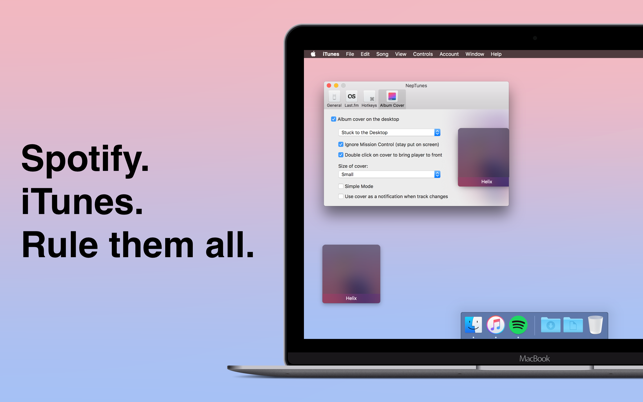 All from beautiful artwork on your Desktop. NepTunes remembers up to 15 tracks, that you played recently and can open Apple Music or Spotify or Last.fm page for each track. recently when I have a song on single repeat it only scrobbles once. 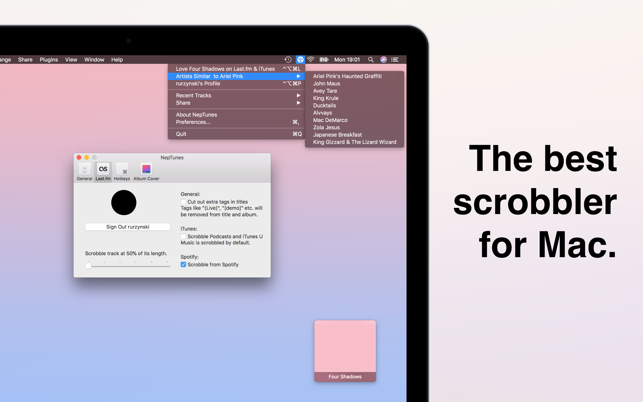 - allow you to pause scrobbling until after an iPhone/iPod sync. - scrobble any music played on my iPhone/iPod even if I carefully avoid playing music on my Mac until after I've synced my iPhone. 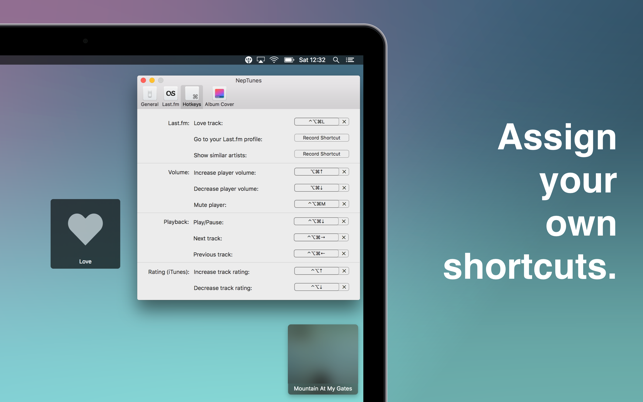 - allow you to use the Album Artist instead of the Artist when scrobbling. That final problem is pretty annoying. "Kathy Diamond & Kaine," "Kathy Diamond & Mastercris" and "Disco Doubles & Kathy Diamond" are all filed under the album artist "Kathy Diamond," but they get scrobbled as separate artists. So, to use a more pop-music example, would "Janet Jackson ft. Missy Elliott", "Janet Jackson & Michael Jackson," and "Janet Jackson." But it's the other two problems that really make this app useless for me. What percentage of people sit at a computer all day listening to music instead of listening to it on their mobile devices. Look, I get it that LastFM's stupid rules to prevent scrobble-scamming, coupled with Apple's closed ecosystem and lack of developer hooks into the iOS music app, make it very difficult to accurately scrobble people's mobile-device listens. But if I'm paying $4 for a Scrobble client when I've used so many free ones in the past, those features are essential. Discovered this app a couple months ago looking for a scrobbler that worked with Apple Music tracks not in my library. Would have rated it 5 stars then, definitely worth 5 stars now with the improved caching and integration in the new version. The only other feature I could ask for is scrobbling from Beats 1, but I’m not sure that’s technically possible?